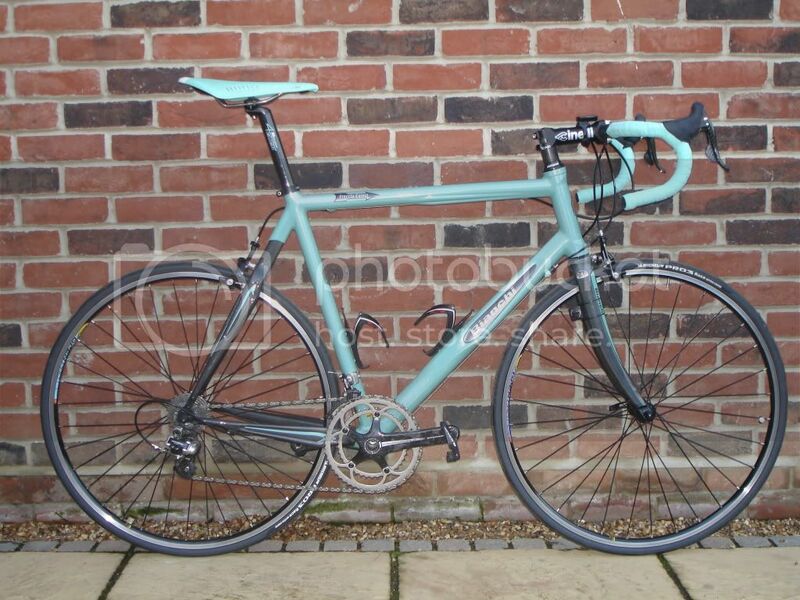 This is my Bianchi Freccia Celeste HC 62cm (2006). 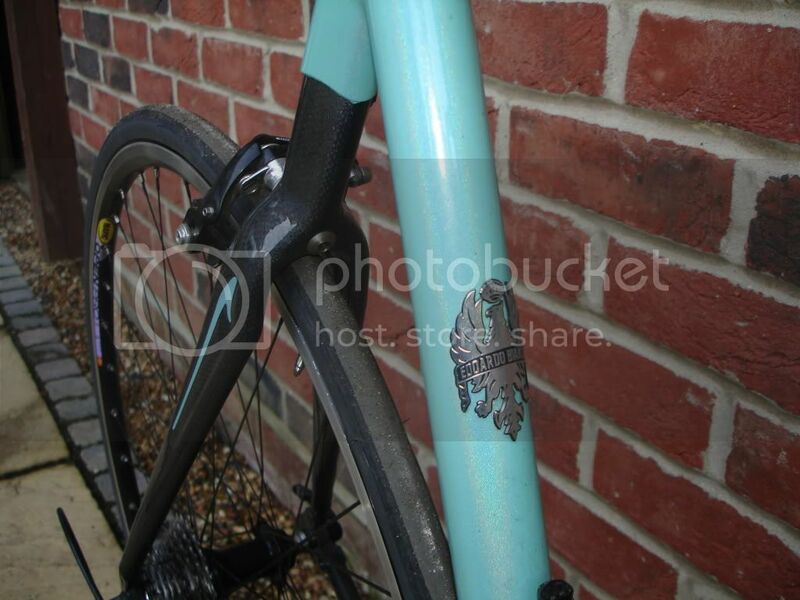 Triple butted hydroformed alu main triangle, full carbon rear triangle, full carbon fork (bianchi badged reynolds ouzo pro). Not very weenie but I'm 6ft 3", 95 kg and this is uber stiff, rides like a dream and isn't gonna break in a hurry.... anyway I love it. Maybe not the lightest weenie but definitely a strong and beautiful weenie (^_^)! Click THIS to hear what happens when I see your and my weenie. Well you claim its no weenie bike. Every weenie bike starts with a bike. It will get there. BTW, it is a very nice bike. Very nice indeed, more celeste I say! So although not weenie what does it actually weigh with that setup? Ha ha! Shucks, thanks Bugman. I'm actually pretty impressed with that weight. FOr such a strong bike 7.7kg is pretty impressive. The only spot screaming out for weight reduction is the wheels, you could loose half a kg there, but the wheels wouldn't be as tough. But you might be able to drop 200grams to get you to 7.5kg and not give up too much. I would love to see more tech and features put into Al frames. I went for a system6 as it was too hard to find a decent cheaper frame for a bigger rider (I'm 6'2 95kg). I absolutely love your (unfortunately, and that's the disease of this time, too small for you) bike set-up! I guess Bianchi either doesn't have a bigger size, or this was a bargain. nice bike sluggo! Big bikes make things interesting. Thanks DeZ (although unfortunately it fit's me beautifully albeit I'll prob drop the stem 15mm). For the solid build and choice components 7.7kgs is pretty good. Tapeworm wrote: For the solid build and choice components 7.7kgs is pretty good. wow, that is a nice bike. Some deep rims and it would be perfect. i love that stem and bar compo, for me that is perfect. yeqh ... i love bianchis and that is nice indeed. you need some new wheels however ... i'd say either go for deep section tubs or a pair of Ti shamal ultras. you'd drop 150-200g or so with that option. My apologies, I took this as a comment on bike fit for the OP. Just seems to me a lot of people have an opinion of what should be the "correct" setup without consideration to the myriad of other issues concerning the art of bike fitting. AFAIK spacers and decent amount of setback does not render a frame too small. Unless it IS actually too small for him, something that cannot be determined by a mere picture. by GregarioForHire » Mon Aug 27, 2018 9:32 pm » in Introduce Yourself / Gallery - Please use metric weights.